We reached the 50 mark for the Stampendous Coterie! Everyone who purchased the eP special will receive a free word stamp (from your secret admirerer). It will be packaged in a this Stampendous acrylic paint can. We are so excited to be able to give everyone these party favors. Go to tell more friends about this exclusive eclectic Paperie offer. Need some holiday/birthday gifts? 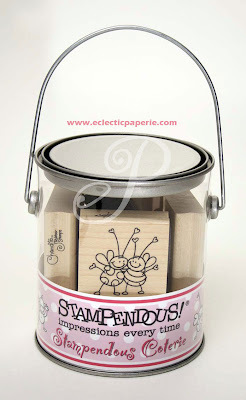 You can still purchase the Stampendous Coterie and you will receive the free stamp and acylic paint can. Everyone who purchases the Stampendous Coterie will receive a free co-ordinating word stamp, Secret Admirer($5.19 value), absolutely free! Plus it will come with this Stampendous acrylic paint can($3.99 value).